Enter the employee's Start Date in the field provided or select the start date using the calendar. If the employee's Start Date is in this tax year, a ‘Starter Declaration’ menu will appear. Select the statement that is applicable to the employee from the drop down listing. If the employee is to be protected under the Transfer of Undertaking (Protection of Employment) regulations, tick the box provided. 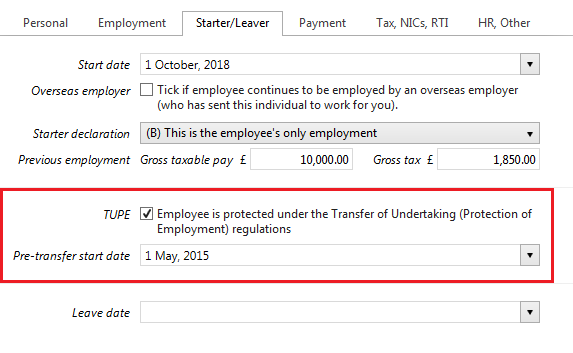 This will allow you to enter the employee's Pre-transfer start date, which will supersede the new employment start date when determining length of service for statutory payments etc. THE EMPLOYEE’S STARTER DETAILS ARE NOW COMPLETE. NOW SELECT THE ‘PAYMENT’ TAB TO CONTINUE TO SET UP THE EMPLOYEE’S RECORD.